If you are looking for high quality security shutters with a brand you can trust, then look no further than www.samsondoors.co.uk. We have top brand, high quality, aluminium security shutters for your windows and doors. The Seceurovision shutters are both stylish and practical and come in a fantastic range of designs with the primary purpose of providing maximum vision and light, making them perfect for retail premises. Seceurovision shutters are suitable for commercial, industrial and residential outlets including offices and shop fronts. Their designs are see-through making them versatile for any building where a more subtle approach to security is required. The various models give varying degrees of vision depending on the size of the open section and the size of the curtain slat used. Compact and lightweight, the Seceurovision 3800 is suited to the highest security, the shutter is made from aluminium and provides 45% vision. 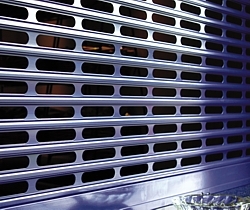 The slats of the shutter are punched giving high security for domestic use and medium security for commercial use. The 3800 has one of the most compact headroom requirements and is our all round most versatile shutter for width under 4000mm wide. Available as a manual or electrically operated shutter and also in almost any colour. To find out more about the Seceurovision 3800 Security Shutters Click here. 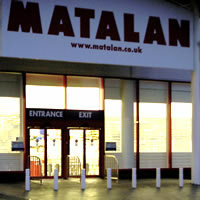 This shutter is ideal for the high street shops and small retail outlets. The Seceurovision 7500 is constructed from Rolled steel is perforated giving 25% vision when the backlight is switched on, giving this a medium security level. 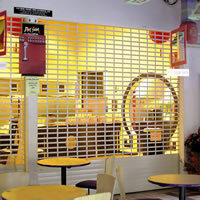 Similar to the traditional security shutter, but with the benefit of higher visibility. The 7500 will provide some of the largest widths and heights where required. 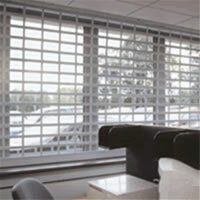 To find out more about the Seceurovision 7500 Security Shutters Click here. The seceurovision 8000 is punched and provides 62% vision for meduim security, ideally suited to indoor commercial retail and counters. The security shutters are stylish and practical at the same time, and with a simple spring-assisted operation making them easy to use. The manual operation is up to a certain size and above that the shutter has to be electrically operated. Each shutter can be manual or electrically operated with group command controls on multiple installation scenarios. They can be finished in White or Brown depending on your office style and then almost any RAL colour as an option. To find out more about the Seceurovision 8000 Security Shutters Click here. Ideally suited for internal use such as offices and receptions and giving medium security, the Seceurovision 8000 provides up to 65% vision and is both stylish and practical with superb light transmission. Made from strong aluminium, the roller grille is robust as well. Can be manual or electrically operated with a wide range of control devices. To find out more about the Seceurovision 9000 Security Shutters Click here. Samson Doors are one of the UK's leading security shutters specialists. If you wish to find out more about all of our security shutters and security products we have available, please either email or contact us directly for advise, specifications and pricing on supply only or supply and installation. All our security shutters are fully compliant with the very latest regulations for safety and use the latest motor drive systems and controls for maximum reliability.